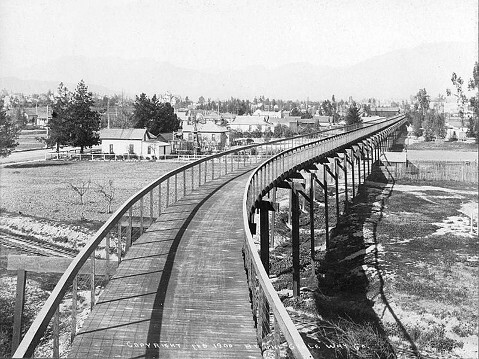 The California Cycleway ran through Pasadena along present-day Edmondson Alley in 1900. Fair Oaks Avenue is to the left. Years ago my husband and I went on a two-week bike tour of the Central Coast. While there were many beautiful and scenic stretches along the way, there were also several sections where the route took us onto the 101 freeway. Trucks and cars whizzed by, while bits of gravel and debris blew to the edges of the road and bumped under our tires. I couldn’t help but wonder, what if there were a separate path for bikes? A smooth strip of pavement stretching for miles, connecting cities and towns and eliminating the need to ride these sketchy shoulders. A bike freeway seemed a bit like a childish dream, but it also sounded like the best idea ever. Turns out, I wasn’t alone in my daydreaming. Horace Dobbins and Henry Harrison Markham also dreamed of uninterrupted biking. They collaborated on a project aimed at creating a six-mile stretch of uninterrupted cycling between Pasadena and Los Angeles. Biking was hugely popular at the time, and the two men hoped to turn a profit by charging riders 10 cents for a one way trip and 15 cent for an all-day pass. The Cycleway was built from pine and elevated about 50 feet above the ground. Unfortunately, right-of-way disputes hampered the construction, and only a little over a mile of the project was actually completed. Six hundred cyclists reportedly participated in the opening day ride, but given the short distance of the cycleway, there wasn’t a sustained interest. Ultimately, the incomplete wooden bikeway was dismantled. While this early attempt failed, many forward-thinking governments are now planning and building modern bike highways. In Denmark the Copenhagen-Albertslund route stretches over 13 miles. It is just one of the 26 superhighways planned for the area around Copenhagen. Copenhagen’s network will include air pumps, lighting, and even rain shelters. The paths are designed to relieve traffic congestion around the city and to encourage healthy transportation. The Danish government anticipates saving over 40 million euros per year of operation as a result of the health benefits of biking. While Copenhagen is at the forefront of cycling infrastructure, other areas of Europe are following suit. Germany just opened a three-mile stretch of what is slated to be a 62-mile “bike autobahn.” Once fully funded, and built, the route will connect 10 cities and is predicted to keep 50,000 cars off the roads each day. With bicycles making up a quarter of all London traffic, the city is moving ahead with construction on an 18-mile segregated path that is expected to be complete by the end of this summer. The cost and route of the construction inspired some controversy, but most residents support the project. A survey found that 84 percent of Londoners are in favor of building the lanes. Santa Barbara has several separated bike paths. The six-mile stretch of the Coast Route between Modoc and the UCSB campus acts as a mini bike highway. Offering the best riding conditions to the greatest number of cyclists in our area, the path allows commuters, students, and even young children to travel safely by bike. Bicycle superhighways are being created by societies that prioritize the health and the long term success of their communities. These cities can serve as an example and an inspiration as Santa Barbara works toward closing the many gaps in our own cycling routes. We may not be traveling the perfect road just yet, but with enough momentum we can keep heading in the right direction.